A day at the Ontario Skills Competition held May 2-3 might have been enlightening for those that believe young people have no interest in the trades. Over 2,100 secondary school students and apprentices competed in 67 categories at RIM Park in Waterloo, Ont. Competitions covered everything from baking to robots and, more importantly for this industry, plumbing, pipefitting, HVAC and refrigeration. Over $65,000 in prizes was presented. Brandon Johnson competes in the refrigeration category, placing second. There were 20,000 visitors over the two days, many of them high school students interested in learning about the trades. In addition to the competitions, most trades had information booths set up to educate visitors. A number of industry companies and associations also had information booths. 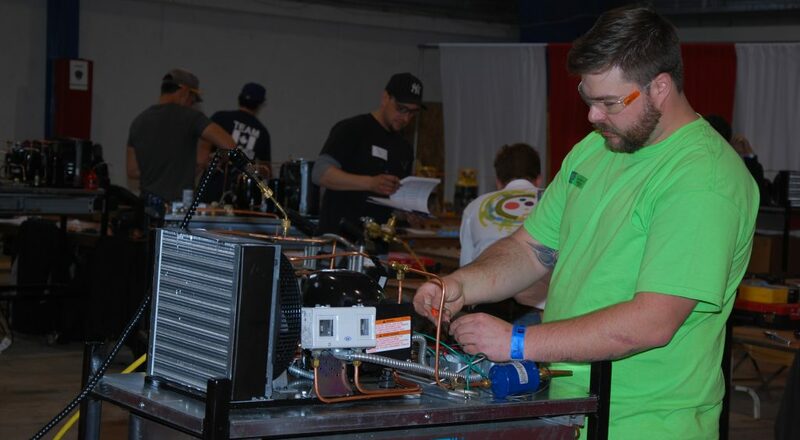 Apprentices were competing to represent their province at the National Skills Competition scheduled for June 5-8 in Moncton New Brunswick, with one exception. Ontario has a unique residential HVAC ticket, so the winner of that category at the Ontario level would, in effect, be the national champion. HRAI’s Alexandra Wennberg, left, and Union Gas’ Corina Emde introduced students to the HVAC trade at the HRAI Career Connections booth.